If you are in the market for a top tier compact digital camera, look no further than the Panasonic Lumix LX100. This point-and-shoot is an engineering gem that will put even some high end DSLRs to shame. The LX100 takes incredible photos and stunning 4k video in a form factor that comes in at only 393 grams. There are smaller cameras in this range, but they compromise on functionality so they can fit in your pocket. The LX100 strikes a near perfect balance between stellar image quality and portability. The price has dropped since its release, but the LX100 is still the 4K point-and-shoot camera to beat. It goes toe-to-toe with any other camera in its class and still holds its own against arguably its fiercest competitor, the Canon PowerShot G7X. The LX100 features a Micro Four Thirds sensor, which is almost double the size of the 1” sensor found competing cameras like the Sony RX100 IV and the Canon G7X. The result is an uncanny ability to take in tons of light. In addition, the LX100’s f/1.7 aperture adds to its light gathering capabilities and creates an extremely shallow depth of field that’s great for capturing gorgeous portraits. 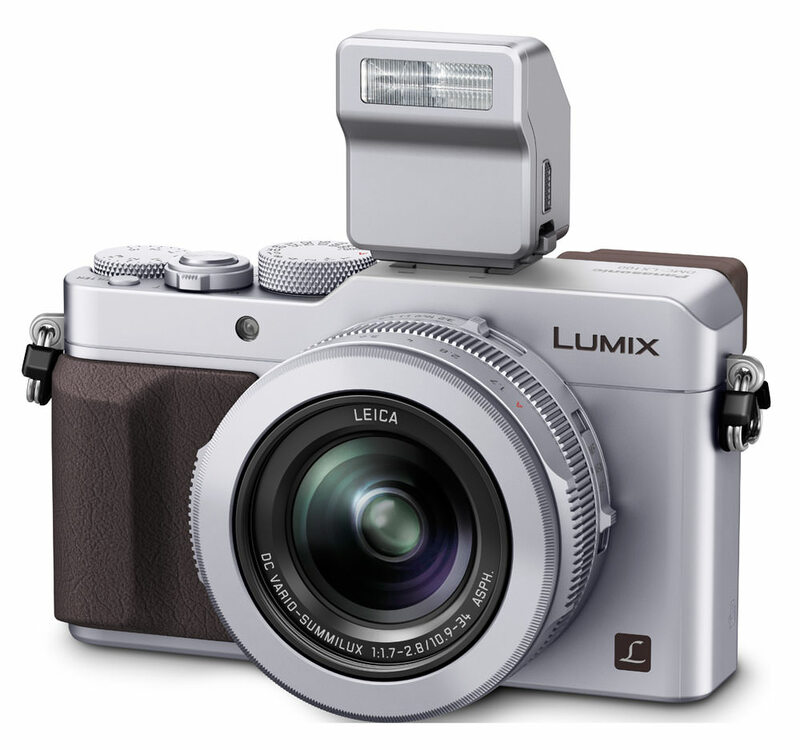 Panasonic managed to pack optical image stabilization into the LX100 as well. This combination puts the LX100 in the running for best in class low light performance. The massive sensor inside the LX100 enables it to implement a clever maneuver while shooting photos. The camera does not use all of the sensor’s surface area while shooting. Instead, it uses a specific area of the the sensor based on the aspect ratio of the image. For example, a 4:3 ratio produces a 12.5 megapixel image from the camera’s 16 megapixel sensor. Some may view this as a drawback, but it is this process that allows the camera to slim down the bulk of the lens, which would be quite a bit heftier if it had to cover the entire sensor. If you are looking for a camera that covers a full Micro Four Thirds sensor, be prepared for the required extra weight. The mixture of the sizable f/1.7 aperture and 4/3 sensor is comparable to a f/3.7 on a full-frame camera which is impressive for the LX100’s small form factor. In many ways, the LX100 raises the bar for cameras in its class. The combination of an excellent Leica lens and the relatively large Micro 4/3 sensor yields top notch photo quality and allow for a wide range of manual control while shooting. The LX100 has a full auto mode which is acceptable, but the camera’s powerful manual options is where it really shines. The LX100 is certainly not for beginners. It will best serve intermediate and professional photographers looking for a portable point-and-shoot that does not sacrifice the wide array of control typically offered by higher end DSLRs. JPEG images shot by the LX100 are clean all the way up to ISO 800 and acceptable up to ISO 1600. Any higher and the JPEGs begin to show a noticeable amount of noise. If you shoot RAW, you can push the ISO all the way up to 12800 and still maintain reasonable quality. However, the LX100 leaves something to be desired when shooting RAW. There is little detail in the highlights and shadows of RAW files. Whites begin to blend around ISO 400 and shadow detail fades at ISO 800. Less than stellar RAW performance is a common issue with this class of camera, so it’s hard to hold much angst against the LX100. The color reproduction of the LX100 delivers pleasing natural results, although images at ISO 3200 and above develop a modest red cast. However, other competing cameras in this range generally produce a pinkish tint across all or part of their ISO range. The Panasonic GH4 has been lauded for its magnificent 4K video results. The LX100 uses the same imaging engine as the GH4 and can capture videos in resolutions up to 4K (3,840 x 2,160). Not surprisingly, the results are fantastic. Videos are crisp and look miles better than 1080p even when viewed on a non 4K display. The LX100 does an excellent job reducing noise, but it clips the tonal range when pushed up to ISO 3200 and higher. Full control over exposure settings are available while shooting video, but the LX100 lacks the Cinelike color presets found in the GH4. However, the lack of a microphone input is a major blow to recommending the LX100 to more serious videographers. The LX100 has a nifty features which allows any frame from a captured video to be converted to a JPEG, although the image quality suffers due to AVC video compression. However, the LX100 also offers a 4K Photo mode which lets you capture solid 8 megapixel stills while recording video. The camera increases its frame rate to capture stills of motion and the quality is much better than converting video to an image after the fact, but this can be a major battery drain. There aren’t many ways to criticize the LX100, but like any camera it isn’t perfect. The LX100 packs in more features than its competitors, but it does come at a cost. While most point-and-shoot cameras are pocket sized, the LX100 is a tight squeeze. It’s more suitable for a coat or even its own dedicated bag. The plethora of physical controls that cover the body of the LX100 can be overwhelming. As mentioned, this camera is simply too much for beginners, and there is still a learning curve even for intermediate and professional photographers. It will take some time to get familiar with all of the features the LX100 offers. Many photographers prefer a camera that simply shoots excellent photos with minimal effort. While the LX100 certainly does that, there are better options if you prefer to shoot in auto mode. It may only be a minor annoyance for some, but others will be severely disappointed in the LX100’s lack of a touch screen. The 3” LCD display can only be navigated with the physical buttons on the back of the camera. This means the common touch to focus feature found on most other cameras in this class is absent from the LX100. Even these supposed “flaws” are subjective, and the LX100 easily remains one of the best point and shoot options available. It is hard to find much wrong with the LX100, and it easily earns our recommendation to anyone looking for a premium, feature packed point-and-shoot camera. As mentioned, the only point-and-shoot camera that comes close to the LX100’s mixture of power and portability is the Canon PowerShot G7X. If you are looking for a high quality point-and-shoot, it would be worth your time to compare the two. To keep the size down, the LX100 comes with a detachable flash unit. It fits on a standard hot shoe. This is nice because it provides the option to use something more powerful which may be desired since the unit is no brighter than most built in flashes. Although it is not technically an accessory, the Panasonic Image app is worth mentioning. It is available for both iOS and Android and allows you to remotely control shooting and playback on the LX100 from your phone over Wi-Fi. Probably the most helpful feature is touchscreen autofocus control. Using the app also enables the LX100 to geo-tag photos using your smartphone’s GPS. Overall, the app performs well and is more capable than other remote apps from competitors. If you sometimes shoot from a distance, this is a nice addition. The essentials that come in the box with the LX100 include a battery charger, battery pack, AC cable, USB cable, lens cap, lens cap string, hot shoe cover, external flash, flash storage bag, shoulder strap and DVD. This camera can also be attached to certain drones such as DJI. The number of physical controls offered by the LX100 really help it stand out in its class. It’s worth highlighting the impressive amount of options Panasonic managed to stuff inside the relatively small body. The LX100 features a physical aperture ring on the lens along with dials across the top of the body for adjusting shutter speed and exposure. Of course you have the option to put all of these options in auto mode if you don’t feel like fiddling. A second lens ring is dedicated to adjusting zoom. There is a lever on top that controls zoom as well, although it is not quite as precise. The LX100 also features a peaking option that highlights focused portions of the shot. There are dedicated buttons on the LX100 for just about everything. White balance, AE/AF lock, ISO, filters, drive mode and autofocus mode all have a native button. Panasonic even added three customizable buttons as if there weren’t already enough. The LX100 takes its time starting up, but once it’s ready to shoot it outperforms most every other camera in its class. The camera can autofocus and shoot in well under half a second and it will take two consecutive shots in approximately 0.4-0.5 seconds. The LX100 regularly comes in around 4 frames per second with autofocus and auto exposure turned on, although Panasonic claims the camera can shoot up to 6.5fps with AF/AE. Alternatively, the LX100 will climb up to 11fps when focus and exposure is fixed. The autofocus is fast but it’s afflicted with a typical issue. It always focuses on the closest object in the frame, which many times isn’t what you want. Panasonic’s clever implementation of using only part of the LX100’s immense sensor along with the large aperture enables the camera to perform quite a bit better than other cameras in its class. The LX100 takes advantage of Leica’s excellent lens technology and creates images and videos that remain crisp and clear, even in less than ideal conditions. The LX100’s ability to swallow loads of light allows the camera to keep noise at a minimum and maintain striking image quality in low light environments. The Panasonic DMC-LX100 is currently available on Panasonic’s website for $699.99 and on Amazon.com for as low as $614.99. The LX100 comes with the accessories mentioned above. Panasonic is also offering free shipping for the camera, and it is available for free shipping on Amazon.com or free 2-day shipping for Amazon Prime subscribers. Panasonic recently dropped the price of the LX100 from $799.99, which was already a good deal. For the superb quality of the LX100, paying anything under $700 for the camera is a win. The LX100 is a top of the line point-and-shoot camera for intermediate and professional photographers. It is stuffed full of features while maintaining a relatively compact design. Image and video quality is superb and 4K video shooting is on par with Panasonic’s acclaimed GH4. Low light performance is remarkable and a winner for those who shoot at night. The Panasonic DMC-LX100 earns our high recommendation.